Leads are used to record information about sale opportunities that will hopefully result in a Quote being created or require a follow up later on. It is very straight forward to create a Lead and in this article we will take a look at how to create a Lead under a Contact record. 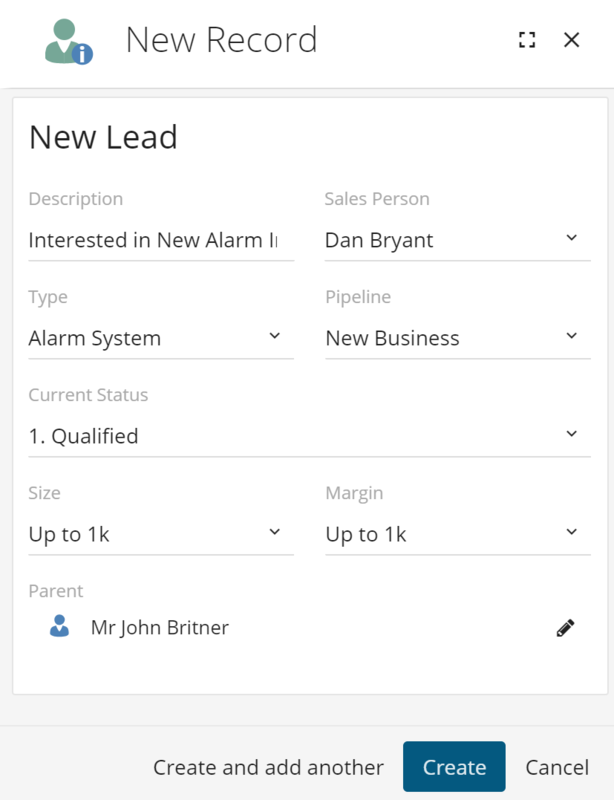 You can create a lead from two places within the CRM; using the quick add option or alternatively from the Lead page. To use the quick add option select the + icon on the right hand side of the contact record and then pick 'Lead' from the drop down options. 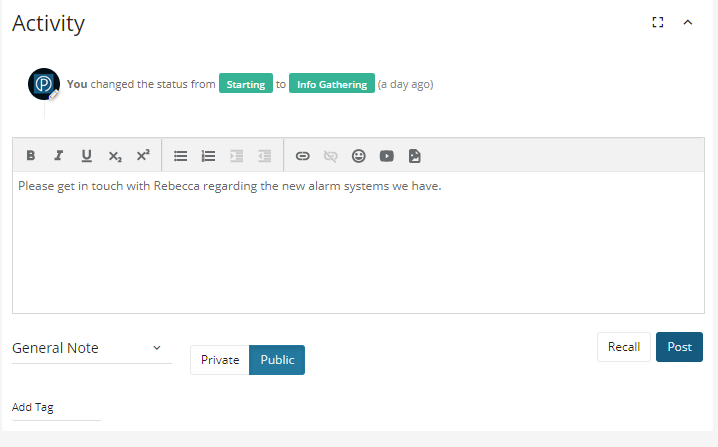 Alternatively, if you navigate to the lead page against a contact record, you can click the + icon to create a Lead. Both of these routes will take you to the below New Record window. Description: When entering the description remember that this is what will be displayed when you are looking under the parent record, so name it something useful and relevant. Sales Person: The Sales Person is who is taking overall responsibility of the Lead. Please note different users of the CRM can still be recalled against the Lead. Type: The Lead Type should help categorise the sales opportunity. 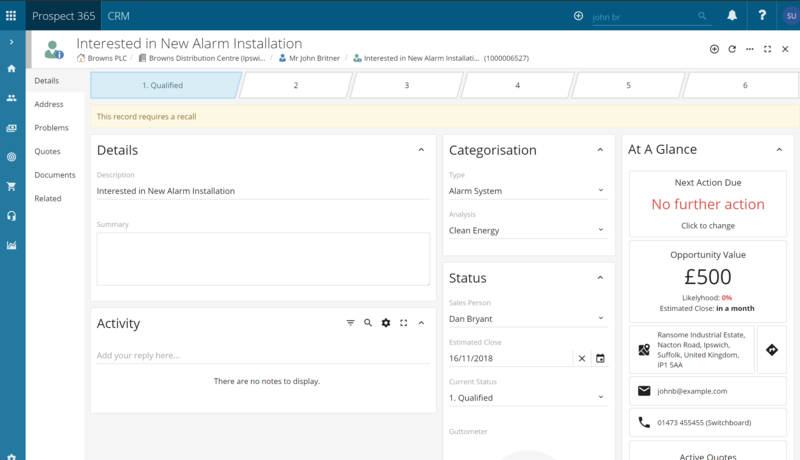 The Type can be selected from a drop down and this is configurable if you have the correct level of authority within the CRM. Sales Lead Pipeline: The Sales Lead Pipeline should represent the steps that your sales opportunity would take from start to finish. For example, your starting status within the pipeline may be 'Enquiry' & the final status may be either Lost or Won. If you have the correct level of authority within the CRM, then you will be able to edit the sales lead pipeline. Please note you can have multiple Sales Lead Pipelines configured. Size: The Size determines what revenue value is associated with this particular sales opportunity. Margin: The Margin should represent the profit margin for this particular sales opportunity. Once happy with the information entered click create. Analysis: Here you can select from a drop-down list to help further categorise what the Lead relates to. For example, you may want to record if the Lead is a one off or if it is returning business. This information can then be used within reports to help build analytics of the sales opportunities you are receiving. Size & Margin: These options allow you to record a monetary value against the Lead. 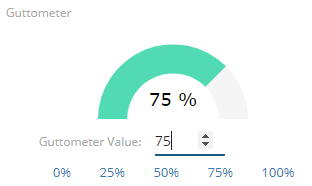 As with the Analysis this can then be used within reports to help show a value which will be received if the Lead is successful. Current Status: This is where you can change the Lead's Current Status as the sales opportunity moves through the sales process from start to finish. Some of these statuses will require a recall, which means that a CRM user must take responsibility of the lead whilst it's in that Current Status. Source & Source Activity: These are very useful options to record where the Lead originally came from. Options could include an Exhibition, a Mail Shot, generated from a Salesperson visit or by visiting your Website. If you have used a Campaign from within CRM you can use the Source option to link Leads to Campaign Activities. This allows you to record potential income based on Activities you have performed, i.e. how many Leads and subsequent Quotes were generated after holding an Exhibition. Guttometer: The Guttometer is used to record how likely you think the Lead is to be successfully completed. A value from 0 – 100 can be entered, this can then be used within reports. Activity: This section of the Lead record shows any information which has been added to the record and any changes of status which have taken place. To add a note to the record simply click in the section labelled ‘Add your reply here…’. This will open up a new section where you can enter your note. Once happy with your note click post. Summary: The summary field should be used to provide a general overview of what this sales opportunity entails.